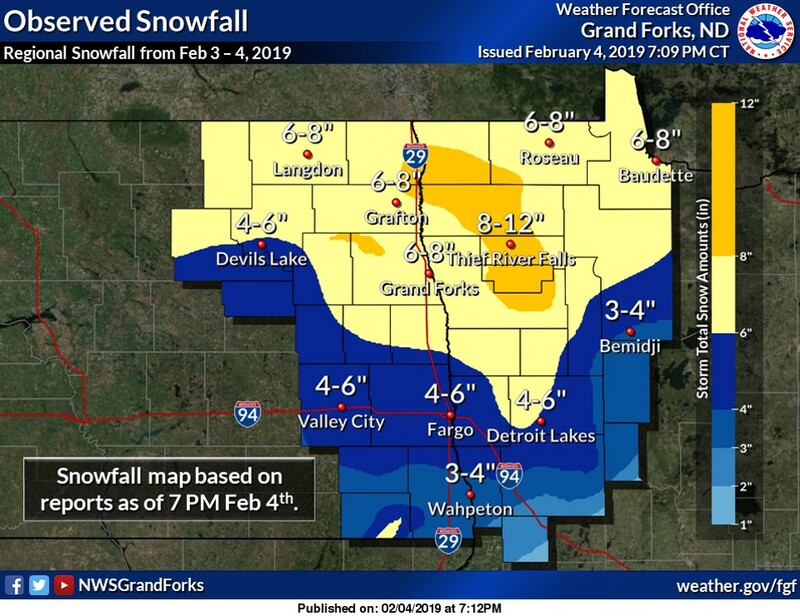 Heavy snow fell in northwestern Minnesota from Sunday to Monday, February 3-4, along with icy conditions over southern and eastern parts of the state. A low pressure system emerged from the southern Rockies over the weekend, and moved towards Iowa and Wisconsin by Monday, spreading a large shield of precipitation across Minnesota. Bands of heavy snow formed in northwestern Minnesota Sunday and Sunday night, leaving behind 6-9 inches of fluffy powder in many areas. Snow accumulations dropped off to the east and south. In southern and eastern parts of the state, warm air aloft melted the falling snow into raindrops, which then froze into a glaze on streets and sidewalks, leading to hundreds of accidents, spinouts, and stuck vehicles. At one point Monday morning, ice closed one track of the Metro Transit Blue Line, and many buses were unable to make it up area hills, leading to long delays. Children in some northwestern Minnesota communities had school delayed or canceled on Monday because of the snow, and in southern and eastern Minnesota, the icy roads caused many school start times to be delayed. Below are some snowfall totals from the Grand Forks, ND, National Weather Service Office. A complete summary can be found here.